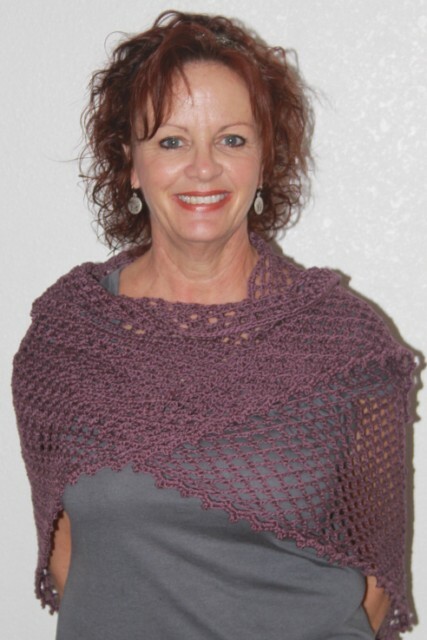 A size G hook was used, along with Sinfonia mercerized cotton yarn to create this generous wrap. Blocked size is about 74 inches wide and 32 inches long. You will need 3 skeins of yarn. Scarves are really in style right now. I created this scarf with my sister in mind. This particular shade of green in her favorite. You are buying the pattern only. Upon receipt of payment, your pattern will be email to you in PDF format. You can expect to receive your pattern in 24 hours or less. A unique combination of textured stitches are used to create this beautiful Aran style afghan that is crocheted in one piece. This afghan was made with Lion Brand Fisherman's Wool Yarn. The finished piece measure about 50 inches by 69 inches. An I crochet hook was used to obtain the gauge. The pattern was tested by two professional crochet artists peggy Cress and Theresa McCune. Skill level for this design is intermediate. You are buying the pattern only, which will be sent to your email address in PDF format within 24 hours or sooner from the time of purchase. 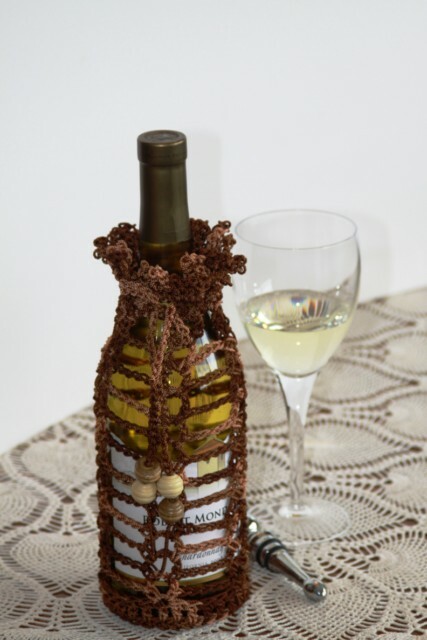 Surprise your host with a bottle of wine presented in this fun wine cozy. it is easy to make, sure sure to please. 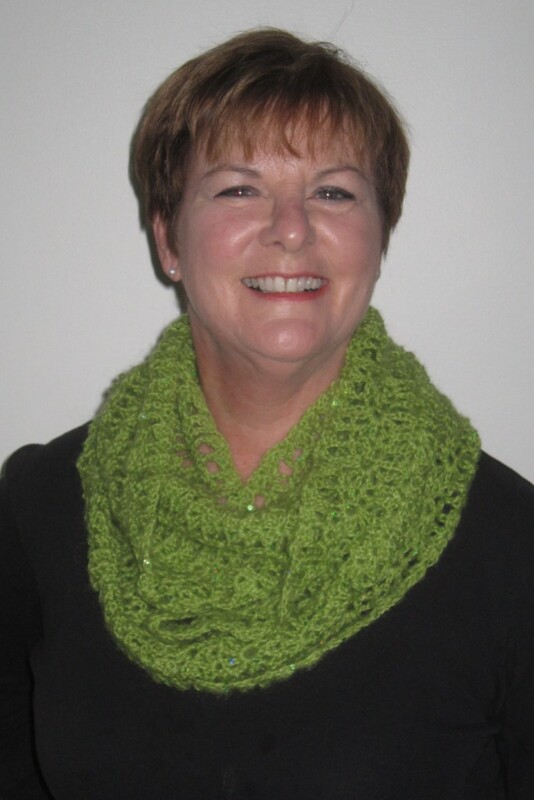 This cozy was made using nylon cord, but you can also use ribbon or worsted weight yarn. You are buying the pattern only. The pattern is in PDF Format, and will be emailed to you within 24 hours or sooner from time of purchase. 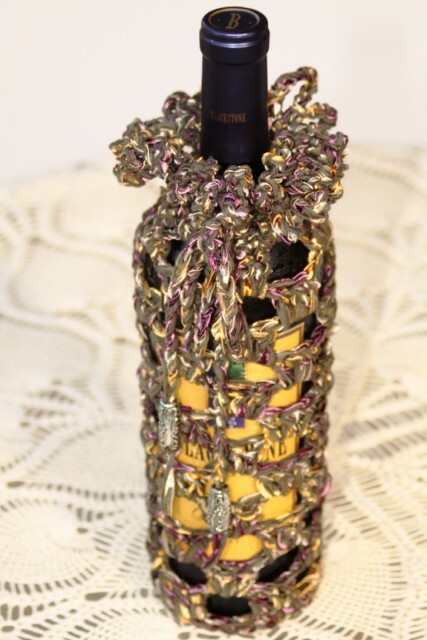 This is the perfect cozy for that perfect bottle of wine. Use ribbon yarn to give it a regal look. You are buying the pattern only. The pattern stitch is easy to follow. You can make this cozy in a couple of hours using ribbon yarn and a G crochet hook. The pattern is in PDF format, and will be emailed to you within 24 hours from time of purchase if not sooner. Any 4 ply yarn is a good substitute for the ribbon used here.